It is never too early to get your child involved in creative thinking. One of the best ways to get them thinking creatively is with art. Children love to draw and paint. If they seem like they really love to paint, or show potential as an artist, you should outfit them with the needed supplies. One of those supplies is an easel. In the following article, we will try to determine what is the best easel for toddlers. Size, weight, and quality are all important factors to keep in mind. 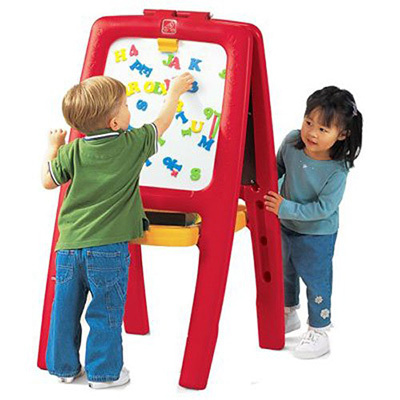 This moderately priced easel is one of the best easels for toddlers and young children. It has a blackboard on one side and paper pad on the other. There are baskets on both sides, one blue and one red, which can hold all your child’s art supplies. 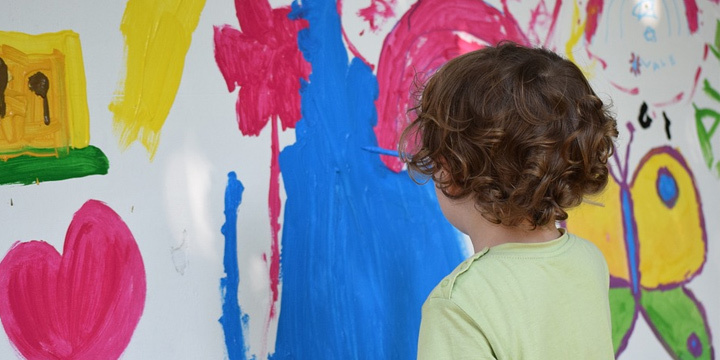 If you are looking for the best art easel for toddlers this wouldn’t be a bad choice. Many people are complaining that the easel is too easy to put together. This means that your child will likely figure out how to take it apart too. This is the only downside to this product; you’ll be putting it back together every time your child dissembles it. Size: 27 x 26 x 47 inches/68 x 66 x 119 cm; Height adjustable. 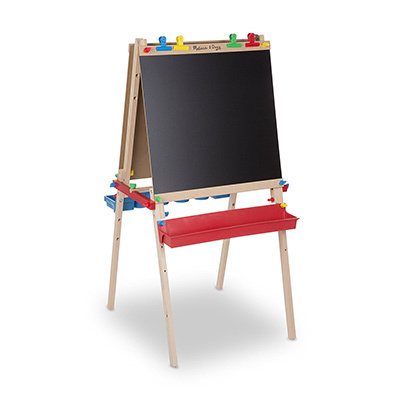 This easel features a blackboard on one side and a whiteboard, for markers, on the other. It also comes with plenty of storage space. A huge basket hangs just above the floor, a smaller basket is just below the board, and another basket hangs on the side. On your search for the best easel for toddlers, be sure to pay attention to this product. One of the trays that comes with this easel is easy to break. In fact, you are likely to break this tray while putting it together. Size: 35.5 x 5 x 22.5/90 x 12.7 x 57.15; Height adjustable. This easel has a blackboard and a magnetic whiteboard. One of the best features about this easel is the amount of storage space. Three baskets are fitted around the base of the easel and a platform hangs just below the actual board. 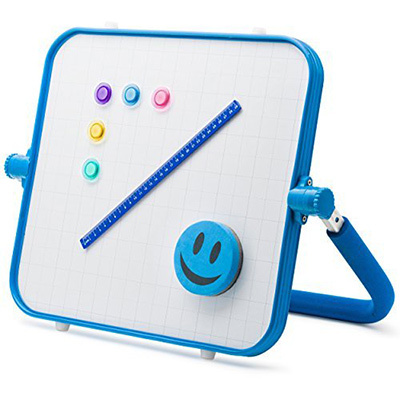 This easel also comes with magnetic letters and dry erase markers. Is this enough to make it the best easel for toddlers? It could be if your child doesn’t care about the magnetic letters. The letters are not very high quality, and they will often not even stick to the whiteboard. This could be the best easel for toddlers for one reason: it’s small. Many of the top children’s easels on the market are tall – too tall for most toddlers to reach. This easel can be set up anywhere. You can put it on the floor or on a table top. One side of this easel is a magnetic whiteboard; the other side is a magnetic blackboard. The easel is held up by a pivoting bar. While this product is great for toddlers, your child will not remain a toddler forever. This is the only downside of this product. It is too small to remain interesting to your child forever. Here is another easel made specifically for toddlers. In fact, this really could be the best easel for toddlers on the market. It is moderately priced, sturdy, and vibrant. The easel has a green chalkboard on one side and a magnetic whiteboard on the other. It doesn’t have much when it comes to storage; however, a platform on each side does slide out for your child to place their chalk or markers in. 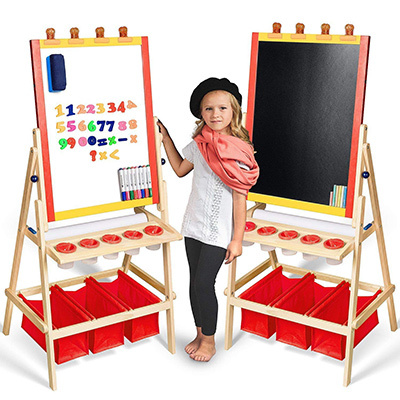 This easel also comes with plenty of magnetic foam letters and numbers. One of the big drawbacks of this product is that it is plastic. This means that it may get dented during delivery. If the box is handled less than elegantly by the mailmen, it will suffer damage. No matter what age your child is you will be able to find an easel for them here. 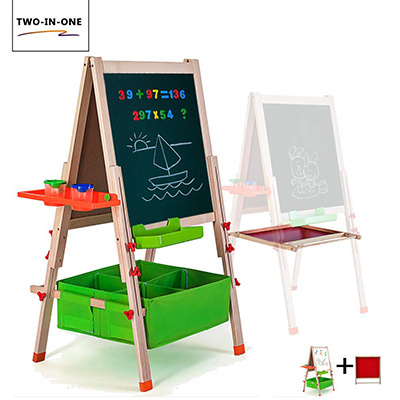 Whether you are looking for the best easel for toddlers or the best easel for older children, there is something for you up above. Have we missed your favorite easel? You can recommend the best easel for toddlers to other parents, using the comment form below!